If It Involves Moving Horses, We Can Handle It. Below is a list of our most commonly requested services. If you need something, but don’t see it here, call us. We can help. Safe, reliable moves of racing stables from racetrack to racetrack. We work with International Shipping Companies to coordinate gatherings and include pick-up from and delivery to the quarantine facility. Give your horse the competitive edge of staying at home before a race. 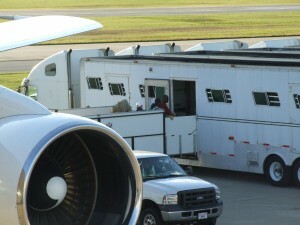 Our experienced horsemen transport your horse to and from the track on race day to ensure they are race ready. Sallee has trucks at most major racetracks to accommodate your race day needs. Please contact the Sallee Agent at your track or training center for arrangements. During select Race meets, Sallee provides complimentary shuttle service from neighboring tracks for the horsemen. Click here for more details. Our fleet of modern trucks combined with experienced horsemen as drivers make trips to and from the breeding shed a great experience for horses, owners and staff. Experienced horsemen with horse show backgrounds give your stable competitive edge and an assurance of an enjoyable, trouble-free trip to and from the show. Increase your odds of being the sales topper! Sallee provides quality sales move-in with customized service to fit your needs. As always, place your trust in our timely, safe shipping. Our team of experienced horsemen load every horse with the safest handling possible and know that extra care is important. We serve as ground transportation for connecting with both Domestic and International flights. Let us work with your forwarding company to simplify arranging your ground transportation needs. Single Stall – The most economical class of travel. Horses travel 3 abreast and are cross tied to keep them secure. Many Standardbred operations ship their horses this way. Stall and a Half – This is the coach class of horse van travel. It provides comfortable space in a standing stall that is 2 abreast and cross tied. 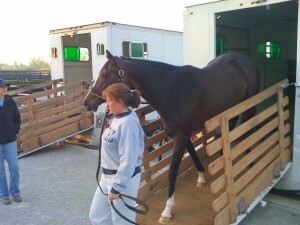 Box Stall – This is the premier way to transport your valuable horse. It allows the horse to have a home away from home where they have room to move around their stall and have the comforts of home with hay and water. 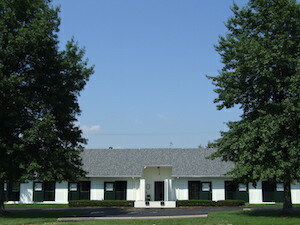 At our Headquarters in Lexington, KY, we have a modern 16 stall, USDA Quarantine-approved barn. It has a built in loading chute to provide the safest possible loading and unloading. Our barn manager is a knowledgeable and skilled horseman who ensures that your horse is comfortable and well cared for during their stay. For your peace of mind and the horse’s safety, we provide round-the-clock care and security. Your horses will be safe, comfortable and well-rested when they stay with us.